Kristi fondly flashes back to her four-year-old self, sitting in stands at Papa Johns Cardinal Stadium during one of the many UofL football games her family has faithfully attended since she was a child (and before, her dad and grandfather’s are former UofL football players). It was a homecoming game, and the king and queen were being crowned on the field. “I want to go on the field! How can I be out there?” she questioned her mom? Mrs. Knop explained to her young daughter that Kristi would have to go through school, get accepted into college, choose to attend UofL, and become involved on campus. 17 short years later, that dream is a stunning reality for senior nursing student, Kristi Knop. Fast forward to October 18, 2014, and Kristi kept warm with a big red and black scarf paired with her dress and heels, standing the Louisville Cardinal’s football field during halftime of the N.C. State game as her name was called over the PA system, crowning her as Homecoming Queen. So what happened in between, that led the 4-year-old dreamer to her senior year at the University of Louisville? Kristi first officially visited UofL as a prospective student during Accolade, a special campus preview event for academically talented students. “I came to Accolade and thought, this place isawesome.” The rest is history. Kristi is a great ambassador for the school, constantly praising the diverse culture of the city surrounding the university, along with her constant appreciation for the “family” like culture UofL exudes. “ Freshman Orientation makes a big difference. It creates that big family feel at UofL ..."
“Freshman Orientation makes a big difference. It creates that big family feel at UofL, from the very start.” Knop went on to be selected as an SOSer, student orientation leader, the summer before her senior year. SOSer’s spend the entire spring before summer Orientation preparing to welcome the new freshman, and then live on campus all summer, leading incoming freshman in 10 Orientation sessions throughout the summer. When asked her favorite thing about Louisville as a city, Knop couldn’t single out just one thing. 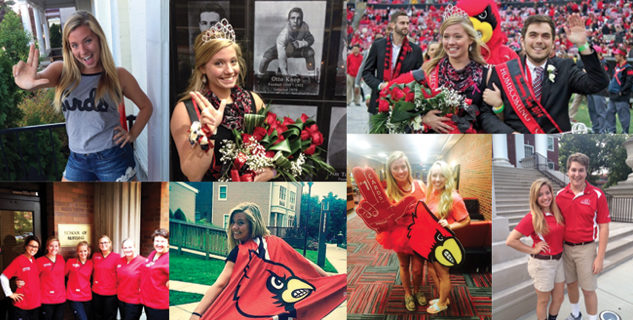 In a fairy-tale sort of storybook ending, Kristi will treasure her experience as a UofL undergrad student, perfectly capped off with a walk across the field that brisk October evening as the 2014 Homecoming queen. She hopes to remain in her favorite city, Louisville, after graduation, to pursue her nursing career.